Before beginning the import process, please click here to learn more about the image file types accepted in Doodly. 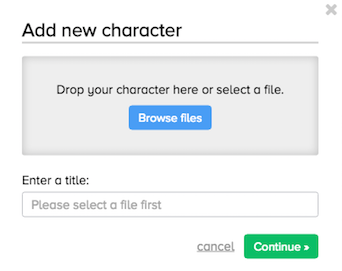 Next, to upload a custom character file, navigate to the 'Characters' menu of your Doodly Dashboard and click the blue and white + symbol. Once that is complete, click 'Continue' to add the file. It will then be available for use within your Doodly account! Please note: The example below shows the "props" tab but it is the same process when you go to the "characters" tab.